Highlight of the weekend was the Golden League Meeting in Paris, where Kenenisa Bekele showed just how good he is – even when not fully fit – by outkicking double world champion Bernard Lagat over 3000 m to keep his jackpot hopes alive. Lagat ran a personal best (7:28 to 7:33), but it still wasn’t good enough. The women’s 800 was an exciting affair, with US steeplechaser Anna Willard outrunning a stellar field in the last few strides in a PB 1:58.80. Matt Tegenkamp, who I have long admired, but who has not quite come up to the standard predicted for him when he was in the running for a medal in the 5000m in the world champs a few years ago has run a 13:07.97 (Season’s Best) in the KBC Night of Athletics in Heusden, BEL, 18 July, a good sign – I really think he can join Bob Kennedy & Craig Mottram as the only white guys under 13:00 for the distance currently. He was narrowly beaten into 2nd by Kenyan Jonas Cheruiyot. We have yet to see anyone match the Kenyans & Ethiopians in sub 12:45 clockings. After having been beaten repeatedly, Olympic champ Pamela Jelimo is back to her winning ways, but only just, beating Kenia Sinclair 1:59.59(season’s best) to 2:00.77. But US steepler Anna Willard is having the season of her life, winning the 800m in Paris in the Golden League, a much higher profile event in a 1:58.80 personal best, (see opening paragraph). It was great to see Lopez Lomong, the USA 1500m runner clocking a 1:46.72 for a season’s best 800m in Belgium. Rashid Ramzi faces being stripped of his Olympic 1500 title after analysis of his “B” sample from Beijing confirmed a positive test for the new drug Cera, an advanced version of EPO. Ramzi claims he is innocent and the Bahrain Olympic Committee has hired a team of lawyers to fight his case. It is reported that Catherine Ndereba will not defend her world marathon title as she does not think she is fully prepared for such a race. 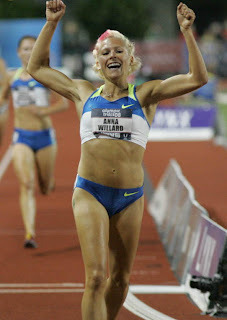 Running with an injury, she placed seventh in London in April in 2:26:22. The kilometre splits for Meseret Defar in her brilliant 29:59.20 last weekend were 3:01.51, 3:04.13, 2:57.79, 3:00.56, 3:01.67, 3:02.04, 3:03.07, 3:02.38, 2:58.40 and 2:47.65. The second 5000 m took 14:53.54 (the first was 15:05.66) and the five fastest kilometres added up to 14:45.91 and the three quickest to 8:43.84. Her time shattered Paula Radcliffe's UK all-comers record of 30:17.15 at Gateshead in 2004 and moved her to fifth on the world all-time list behind Wang Junxia 29:31.78, Meselech Melkamu 29:53.80, Tirunesh Dibaba 29:54.66 and Elvan Abeylegesse 29:56.34. Waldemar Cierpinski of East Germany denied Frank Shorter (USA) the opportunity to become only the second marathoner in history to win two successive Olympic titles when he beat the American in heavy rain in Montreal. Cierpinski won in 2:09:55, with Shorter second in 2:10:46 – more than 1½ min faster than he ran in Munich. As in Munich, Karel Lismont (BEL) was one place behind him. Lasse Viren (FIN), who won both the 5000 m and 10000 m on the track, finished fifth. Four years later in Moscow Cierpinski himself scored a second win. He was subsequently, almost 25 years later, discovered to have been on the East German state-run drug program & American Don Kardong who was 4th, lost out on bronze. Again my thanks to Riel Hauman of Distance Running Results.